Satchmo at the Waldorf is truly a must-see production in an impressive end to the season | By Sandra Schulman WPB Magazine arts & entertainment writer, music and film producer. (Archived story) – The new production of “Satchmo at the Waldorf” at Palm Beach Dramaworks has a jarring beginning – after seeing Louis “Satchmo” Armstrong blow out the last few notes of what was probably a tremendous set – as related by an unseen audience with loud cheers and applause – Satchmo stumbles into his swanky dressing room en route to his hotel room – “I’m not just playing here, I’m staying here!” Armstrong later defiantly says – and then drops a devastating personal bomb. I won’t relate it here, but suffice it to say, it’s March 1971 in NYC and you realize he’s an old, sick man with four months to live and he just gave his last performance. In fact, there’s a canister of oxygen by the padded leather chair which he huffs from frequently. It’s a show about a jazz legend though you won’t learn much about the music but you learn plenty about the man. 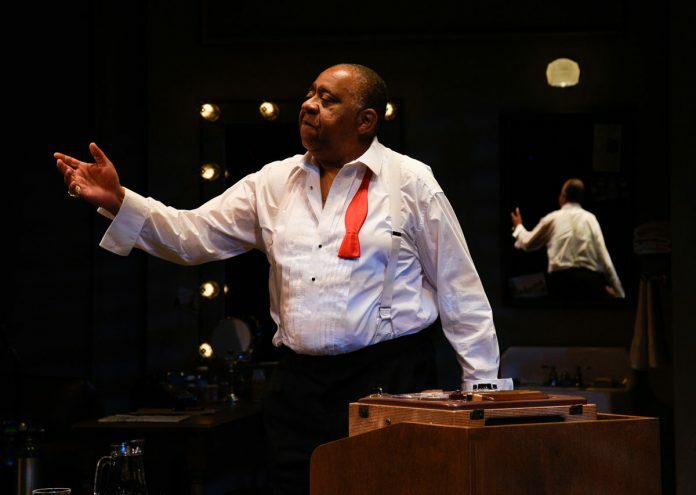 Played with stage commanding authority by Barry Shabaka Henley, Armstrong – a son of a prostitute, a grandson of a slave – relates his life story in an extended flash back and flash present monologue. 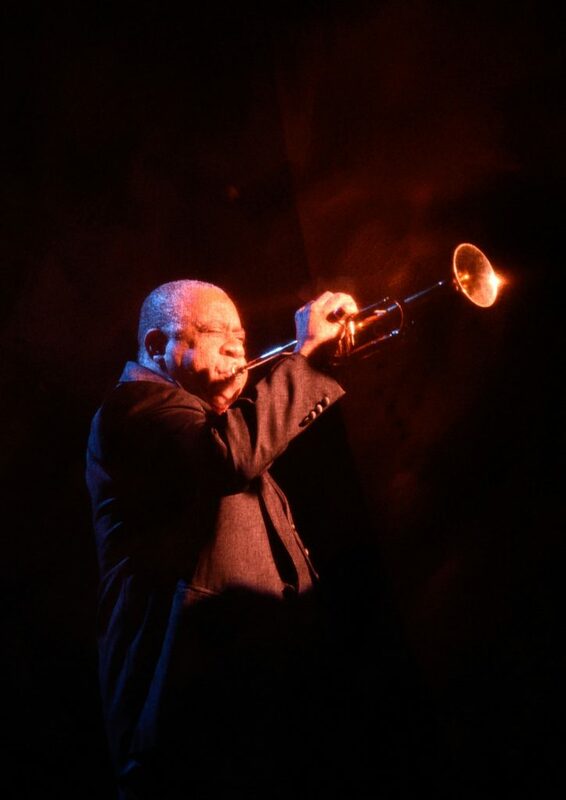 Written by Wall Street Journal drama critic Terry Teachout, who also wrote a biography of Armstrong in 2009, Satchmo at the Waldorf conveys this unlikely trajectory — from New Orleans’ red light district to Manhattan’s Park Avenue. Often thought of as the grinning, big voiced entertainer, behind the scenes Satchmo swore like a sailor and has nasty relationships with his manager Joe Glaser and with Miles Davis. Both characters appear in menacing side stage spotlights but are all played by Henley himself using a change of voice and stance. Miles appears in a deep red spotlight with background smooth jazz. His hep cat gravel voiced cool contrasts with Louis’ big, friendly persona. Miles introduces political substance as the younger generation of black jazz artists who are disdainful of the old school “Uncle Tom” way of performing. Armstrong defends his right to make people smile and gleefully notes that with the smash success of Hello Dolly, a song that toppled The Beatles on the charts – he made the big time. He also admits that years later he could barely remember the words. His manager Glaser was a tougher foe as he screwed him out of money at the end. Louis’ monologue takes turns with Glaser’s, and the two get a chance to tell their sides of the story but you don’t root for Glaser and smirk at the increasingly foul language Louis uses against him. Hello Dolly indeed. He changes clothes – from his stage tuxedo to a robe to street clothes. He smokes a joint, plays music on a reel to reel and settles into various chairs. He’s comfortable in this dressing room, a hard earned refuge in an era where black entertainers were usually treated as second class citizens, playing in classy venues but he had to enter through the back door and eat at the kitchen door. The lighting and set décor play a major role in the success of this production from the opening view of Armstrong on a stage that becomes a wall in the dressing room thanks to clever lighting and use of see through screens. Projections of cartoons, photographs, trippy floral scenes and late night mood lighting really bring the stage alive. It’s no easy feat to hold a stage solo for two hours, something that Henley does admirably, switching from ecstatic to weary, troubled to resigned. He literally walks into the other characters of Glaser and Davis at the sides of the stage, adding a pair of shades and changing the way he stands and talks as the main lights dim and a spotlight zeroes in on the new character. According to Teachout it’s a “work of fiction freely based on fact” – a fascinating way to bring a biography alive. The only other show that may be comparable is the recent production of Lady Day about Billie Holiday who stumbles through a late career performance while telling her life story, though she shared the stage with a live band. Armstrong saw himself as an entertainer, not an artist, so his persona and the business that bought that persona was all consuming. This led to a conflict within him of the hardships he endured growing up and the dark side of segregation he needed to deal with and hide from his mostly white audience. He was upset that his peers were critical of his kowtowing demeanor as he was not an outspoken radical for black power. The success of his life – the first black person to host a radio show, the first to be billed above the title in a film, having a hit song – made him grateful not angry. What is also special about this production is having Teachout direct for the first time. It’s intimately his material, so he knows it inside out in his head, adding to the richness of details and nuance. Henley is a large man and effectively conveys the bluster and confidence of Armstrong in this last performance. For those not aware of the dark underpinnings of his life – and that is probably most of the audience – it’s a revelation and a heartbreak as Armstrong unearths the racial, social and economic barriers he had to cross again and again to get to that room in the Waldorf, smiling through his clenched teeth all the while. Truly a must see production in an impressive end to the season. If you visit, get tickets at: www.palmbeachdramaworks.org or call the Box Office phone number (561) 514-4042 ext. 2. Satchmo at the Waldorf plays through June 12, 2016.